My name is Galina Solovieva. For more than 16 years the doors of my flat are open for the travellers from all over the world. It is all started in 1994, when I've first met modern nomads at Yaroslavsky railway station, the Trans-Siberian terminus. Actually my flat has become the first and only one hostel in Moscow for many years. It is located in a historic neighborhood just in 20 minutes walk from Red Square and Kremlin. It is listed in many guide-books like Lonely Planet, Let's Go, Frommer's and so on. 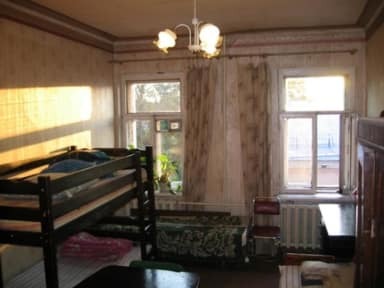 Nowadays there are about 54 hostels in Moscow, but my place is different. Yes, it is just that - a private, basic Soviet-era flat with 2 rooms that I rent out. 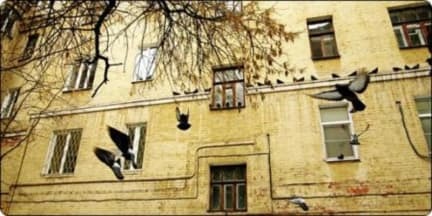 Hope, it gives you the rare opportunity to see inside a typical Russian home - indeed, to be welcomed in and to experience the life of a Muscovite. The close quarters also make it a good spot to hook up with other travellers. My place is a favorite with low budget backpackers of all ages looking for personal sightseeing advice, late-night chats over tea or beer or cheap beds for good sleep after long journey. Very authentic, Russian flat in a great location and with very hospitable owner. I can absolutely recommend! Gslina is a really nice person, who tries her best, to make you feel good. Our short impression about galinas flat, we leave after, was dingy and blowsy furniture/ facilities. On the staircaise to the flat was cat excrements, so it smells strong. Two cats were in our room, one in the bed. The wall and door were creached by the cats. One day before we arrived she told us about renovation from the kitchen... see other comments. We have left because we feel unwell . Galina seems to be okay, we can't say much, but the flat isn't. Galina ist sehr freundlich und hilfsbereit. Sehr negativ mussten wir die Sauberkeit des Hostel bewerten. Das Hostel war sehr müffelig, (Küche Bad, Toilette und unser Zimmer) zudem gab es auch Kakerlacken in der Wohnung, was sehr unangenehm für uns war. Ich würde dieses Hostel nicht weiter empfehlen.